The new Nikkilä bus terminal will open on Monday 19 November and the temporary bus stops in front of Enter will be closed. However, finishing works will continue for some tome after the opening. 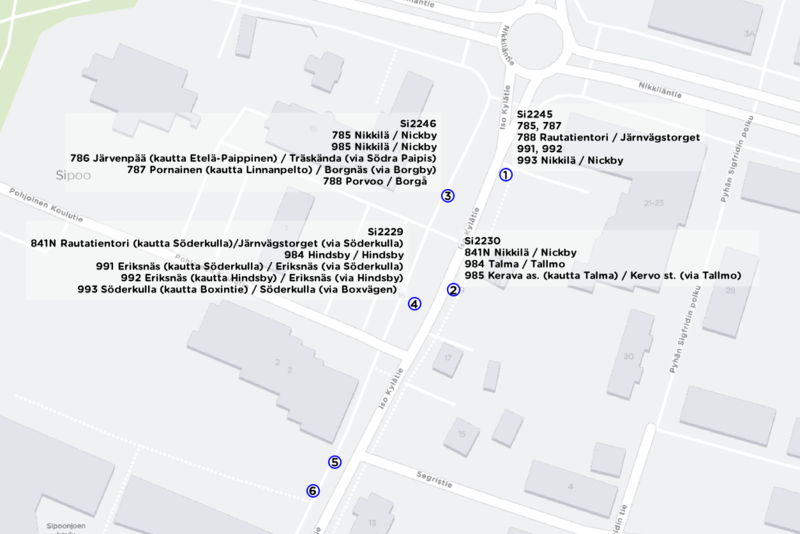 Bay 1: 785/K, 787/K and 788/K to Railway Square (Rautatientori, Helsinki) and 991 to Nikkilä bus station and 992 and 993 to Suursuontie. Bay 2: 841N to Nikkilä bus station/Jokimäkeen, 984 to Talma and 985 to Kerava. Bay 3: 785 and 985 to Nikkilä bus station (via Itäinen Jokipuisto), 786 to Järvenpää, 787 to Pornainen and 788 to Porvoo. Bay 4: 841N to Railway Square (Rautatientori), 984 to Hindsby, 991 and 992 to Eriksnäs and 993 to Söderkulla. At first, bays 5 and 6 will be used for bus parking, but from 9 December, buses 986 an 987 will use bay 5.